The other resurrection was, as many fans suspected, Kon-El, a.k.a. Conner Kent, the Superboy who was cloned from a “dead” Superman way back in “Reign of the Supermen,” who went on to appear in his own series, Young Justice, and Teen Titans until he was killed off in Infinite Crisis. I’m not a huge fan, but I did think it was a waste to kill him off. But since he doesn’t seem to be back in the present day (unless he’s the Kryptonian Nightwing, or has his ID been revealed? ), I have to wonder whether he’ll be staying in the 31st century. As for the Time Trapper being an older Superboy Prime…I have to say, “meh.” I liked the idea from Zero Hour of him being an older Cosmic Boy, but I think that’s long since been abandoned. This means Superboy Prime has been retroactively inserted into decades of Legion stories, and will no doubt be around for much longer, and I absolutely loathe Superboy Prime. He’s annoying, he’s overly powerful, and the way writers (Geoff Johns in particular) use him as a stand-in punching bag for elements of fandom that they dislike strikes me as juvenile and faintly offensive. I’d be quite happy to never read another comic with Superboy-Prime again. The question that the explanation of Bart’s return raised with me is: If Bart saw his “adult self” die, does that mean he’ll never grow up? I wonder why Superboy’s* presence matters, at all. Superboy’s nowhere near Superman’s power levels and Superman is nowhere near Superboy/Superman Prime’s power levels. Prime seems to have something approaching Pre-Crisis-levels of Kryptonian strength, by the way. .-= West’s latest blog post: Comics for sale =-. To your strike-out question… Nightwing’s ID has been revealed and it’s not Conner. I liked it a lot. I think Perez is just amazing and — in toto — it will make a super-fine trade. I’m so over all the continuity stuff, too, so any discrepancies don’t bother me at all since none of it makes any sense anyway. btw, the Mark Waid AICN interview has all sorts of Flashy goodness in it (among other things) so I’m surprised you haven’t touched upon it yet, O’ Mighty Kelson. .-= Richard Pachter’s latest blog post: Tucker Stone reviews! =-. @West: Good point on relative power levels. I’ve never been a big fan of quantifying them the way that I get the impression Marvel does, but here it seems it shoud be significant. @Richard: Mainly I’ve been too busy to read the whole thing and pick out some good quotes. That and more timely stuff (the Rebirth preview, Lo3W) keeps coming up. I figure it’ll keep a few days. It doesn’t look like Connor will be staying permanently in the 31st century. DC released a couple of pages from the new Adventure Comics, staring Superboy. It showed him in Kansas with Ma Kent and Krypto. I’m glad we got Bart Allen and Conner Kent as Kid Flash and Superboy again respectively. If they just insert those two back into Teen Titans, I might be interested again. Actually, the best lineup remains those two with Robin, Wonder Girl, Starfire, Raven, Cyborg and Changeling. The only Titans run I enjoyed better was the Perez-Wolfman era. You know, how they brought Bart Allen back was VERY similar to how they brought Iris West Allen back from the dead in the mid 80s. There are some definite similarities. No doubt. When I was reading Brainy’s words, I instantly thought of Iris being “spirited away” at the moment of her death – which I thought was in the 90s (her resurrection, not her death). Iris’ is one of the worst resurrections ever, imo. What little I understood or cared to understand about Brainy’s explanation reminded me of a cross between Iris’ resurrection and echoes from “The Nexus” in Star Trek: Generations. Great review. You’re right on the money about Perez, about Bart’s personality (and his backstory — Johns has a way of just offering up events and forcing you to accept slapped-together explanations), and in particular about the problems with SBPrime — who is IMHO the one real problem with this otherwise wonderful mini-series. .-= Chris M.’s latest blog post: A thought for Memorial Day =-. i love the fact that superboy has made a return he is amazin n im a huge fan of his especially him in teen titans i will now start buyin comics agen. does any1 wen he will be appearin next???? apart from part 5 final crisis and does any1 no wen part 5 is released? 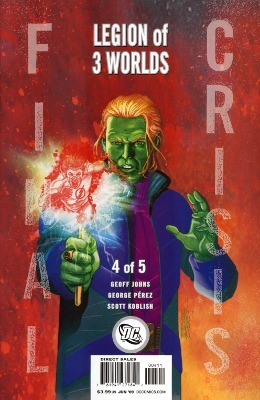 Legion of Three Worlds #5 is currently scheduled for July 8, but of course who knows whether there will be any more delays over the next month. Following that, Superboy will be a regular in the new series, Adventure Comics, starting in August. DC has posted some preview pages.